When The Purge was released in 2013 it was a critical failure but a commercial success. That kind of result is almost guaranteed to generate a sequel, and possibly launch a new franchise. 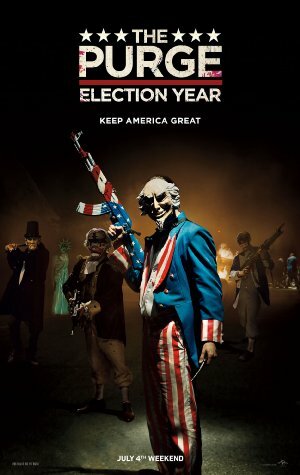 The following year brought The Purge: Anarchy and now the third entry, The Purge: Election Year is in theaters. The annual Purge, which began in 2022, is 12 hours of incredible mayhem where anything is legal, even mass murder. It had come into being the prior decade when the New Founding Fathers of America (NFFA) took power following the near destruction of the economy. Police and other emergency personnel will not respond during this time. Now 18 years have passed and “Senator Charlie Roan” (Elizabeth Mitchell, who was wonderful on “ER” and “V” on television) is a candidate for the presidency. Everyone else in her family was murdered during the purge 18 years earlier. Naturally, her main campaign issue is bringing about an end to the Purge. Her opponent in the election is “Minister Edwidge Owens” (Kyle Secor), a NFFA figurehead as it is “Caleb Warren” (Raymond J. Barry) who is the person actually running the NFFA. Senator Roan’s head of security is “Leo Barnes” (Frank Grillo) who we first met in The Purge: Anarchy. Since the NFFA sees Senator Roan as a real threat to their grip on power, they arrange for the immunity from the Purge that normally protects people like Senator Roan to be revoked right before the Purge is scheduled to begin. Another person whose world is threatened on the eve of The Purge is convenience store owner “Joe Dixon” (Mykelti Williamson). His Purge insurance is being cancelled because the premium cost was raised so high he couldn’t pay it in time. So he sets out to protect his store with his own cache of weapons, aided by his one employee “Marcos” (Joseph Julian Soria). He can also count on help from “Laney Rucker” (Betty Gabriel” who is an EMT who drives a reinforced RV around during the Purge to help the victims. Senator Roan insists on staying at her home, but there is an NFFA plot to kill her and the resources behind the plot are considerable. There’s also a plot to take out the NFFA leadership being organized by a Purge resistance leader named “Dante Bishop” (Edwin Hodge). Through a confluence of events Senator Roan’s party winds up joining forces with Joe Dixon’s group. Like its predecessors, The Purge: Election Year is filled with brutal sequences of torture and killings, all done for the pleasure of the thugs who make the purge what it is. The message of both Senator Roan and Dante Bishop is that the Purge is exacerbating the gulf between the “haves” and “have-nots” since those without means can’t afford to secure their homes against those who take part in the Purge. Also like The Purge: Anarchy, this is an improvement over the original film. It isn’t great movie making but it works. Elizabeth Mitchell and Frank Grillo have just the right amount of chemistry as one would expect between a powerful politician and their most trusted bodyguard. But the best relationship is that of “Joe Dixon” and “Marcos” who are very committed to helping each other. Buy a big tub of popcorn and enjoy the action.